Find out everything you need to know on the new Ford Transit Custom from independent vehicle review website Car And Driving. You can watch the video review to the left to see more of the car or read their written review below to get a true insight from an expert in the automotive industry. Ford Transits lead a tough life. Always have, always will. It's the nature of the market. They need to cover a huge array of tasks, from rental fleet vehicles to crew buses, ice cream vans to site workhorses and airport taxis. In short, the Transit needs to be able to do almost anything. A few years ago, Ford realised that trying to do all that from one platform was just too big an ask and now the Transit is a family of models, that encompasses everything from a lightweight Transit Connect city van right up to a hefty tipper truck. The bedrock of the Transit range, and still the definitive model today, is what's now called the Transit Custom to differentiate it in the minds of buyers and if you haven't driven a van for a while, you need to try one of these. Perhaps you thought vans were crude and awkward to drive. If so, prepare to have your perspectives rearranged. That's what happened when we tested the top 2.0 TDCi 130PS long wheelbase variant. Whether you choose your Transit Custom with long or short wheelbase, as a standard van, Double Cab or Kombi minibus or in whichever payload or trim level, it'll come with a 2.0-litre TDCi EcoBlue diesel engine up-front. There's a choice of output though, ranging from an entry-level 105PS unit, through this 130PS mid-ranger and on to the 170PS flagship motor if your hauling needs are heavier. Whichever of these you choose, sales statistics suggest that the bodystyle variant you're most likely to want to match it to is the short wheelbase, low roof model, a version that should feel even more car-like to drive than its larger contemporaries. And Ford's engineers have certainly gone to great lengths to make this Transit feel more car-like at the wheel than ever before. To achieve this, the Ford global one-tonne platform which underpins the Transit Custom was made much stiffer and stronger - increasing torsional stiffness by as much as 37 percent - benefiting both handling and noise levels. Tuning of the suspension components and steering system resulted in significantly improved ride comfort too, along with the required more precise and agile handling. Like the current Ford Focus, the Transit Custom also features the latest Electronic Stability Program technology with Torque Vectoring Control for better traction and stability. The stiff structure, together with a determined effort to eliminate unwanted noise and vibrations throughout the vehicle, has resulted in a quieter environment for the driver. As proof that this has been achieved, Ford claims that speech intelligibility has improved by nine percent within the cab in this generation model. A van can have all the bells and whistles but be dead in the water if the numbers don't add up when it comes to running costs. At first glance in this case, the mathematics appear to add up. The Transit Custom hasn't overreached itself on price and low running costs start with the excellent fuel economy, delivered by the improved version of Ford's 2.2-litre Duratorq TDCi diesel engine. Fitted with Auto-Start-Stop as standard on all Stage VI vehicles, you'll see a combined fuel consumption figure of 42.8mpg, with emissions rated at 174g/km, which is a meaningful reduction of around 8 per cent compared to the previous Transit. Other factors that drive down overall cost-of-ownership are minimised maintenance and repair times, a 12-year anti-perforation warranty and the longest service intervals in the class at two-years /50,000 km/30,000 miles. 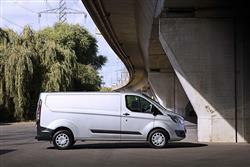 During the development process, Ford designers and engineers gave maximum priority to combining the largest possible load box within the Transit Custom's stylised shape. Particular attention was given to the detailed design of the bulkhead and body sides to optimise the size and practicality of the load space. The result is that the Transit Custom offers best-in-class load volume of 6.0 cubic metres in the short wheelbase model and 6.8 cubic metres in the long wheelbase version. That's just the start. There's class-leading width between the wheel arches of 1390mm and an unparalleled opening height and width of the sliding side doors that can easily accommodate 8ft x 4ft boards, vertically or flat. Other clever features available include a load-through hatch in the bulkhead which enables loads up to three metres in length, such as pipes or ladders, to be safely carried inside a SWB Transit. An integrated roof rack system folds down when not required, reducing wind drag. Plus there are lockable check arms on the rear cargo doors that enable you to lock them in place at 90 degrees open, even on the windiest days. Repositioned tie-down hooks and fixing points are located on the body sides to keep the floor clear of intrusions. And there's an easy-clean load floor liner and ultra-bright LED load space lighting. So is the Transit Custom the best mid-sized van you can buy? There's certainly no shortage of contenders for that accolade in a class characterised by strong competitors like Volkswagen's Transporter, Mercedes' Vito and Vauxhall's Vivaro. The International Van of the Year jury though, had no doubt on the matter, pronouncing this Ford as its winner by an enormous margin when this model was first launched. Their consensus was that this LCV had managed to set new standards in styling, driveability and load-carrying practicality. They also praised its car-like feel, its safety and its low running costs. In short, they liked it very much indeed. Will you? We think so, yes. Before this Ford came along, buying a van in this segment meant a balance of compromise between capacity, driveability and value. At the wheel of a Transit Custom, the need for such compromise vanishes. Especially in the pokiest long wheelbase form we tried, it's the go-to choice in its sector.